is subtle, mysterious and difficult. Still it has the strength of a great spirit. And bring about ten thousand attainments. It reveals all aspects of the dharma. Call out: you’ll just hear the sound of your own voice. Its moral strength transmits the teachings. Only the mind-king can perceive its underlying clarity. Even though we can’t see it in front of us. The mind-king is exactly like this. and faces the gates of perception, where things come and go. Remaining completely at ease, with no obstruction. But remember: what the mind-king does, anyone can do. That same conscious mind sees the Buddha. Mind is, so Buddha is. Buddha is, so mind is. Discipline your mind and control your self. This mind is instantly Buddha. Don’t take up any kind of defilement. Greed and anger are real. Sit up straight and become a Buddha. And you have attained the paramitas. Not looking for any other source. This clear understanding is the real mind. Apart from Buddha, no mind. There is no adequate way to express it. You’ll just keep floating and sinking, floating and sinking. Awakens to this dark and mysterious sound. requires nothing more outside itself. have free and unobstructed minds. Emptiness lacks any substantial nature. May do harm, or do good. Are neither hidden nor apparent. May act in a deluded way, or may act with wisdom. Protect your mind at all costs. Is like gold and jewels in the middle of this world. In this way also exists in the body and mind. Is neither shallow nor deep. Already embrace this fundamental mind. Exist beyond past, present and future. A legend relates, against all the evidence, that Fu-daishi was the inventor of the buildings intended to contain the sūtras. This kyōzō (経蔵) building in Japanese Buddhist architecture is a repository for sūtras and chronicles of the temple history. 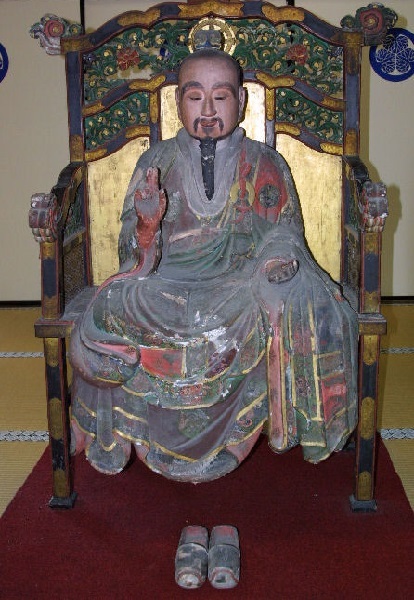 It is also called kyōko (経庫), kyōdō (経堂), or zōden (蔵殿). A revolving sūtra storage case is called rinzō (輪蔵, wheel repository; rotating libraries). Revolving shelves are convenient because they allow priests and monks to select the needed sūtra quickly. 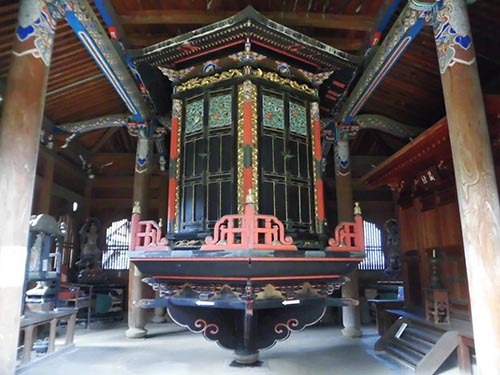 Eventually, in some kyōzō the faithful were permitted to push the shelves around the pillar while praying — it was believed that they could receive religious edification without actually reading the sūtras. Taipei : The National War College in co-operation with The Committee on the Compilation of the Chinese Library, 1967, pp. 253-254. The Bodhisattva Shan-hui, better known as Fu Ta-shih, born in 497, was one of the most extraordinary figures in Buddhism and an important precursor of the School of Zen. 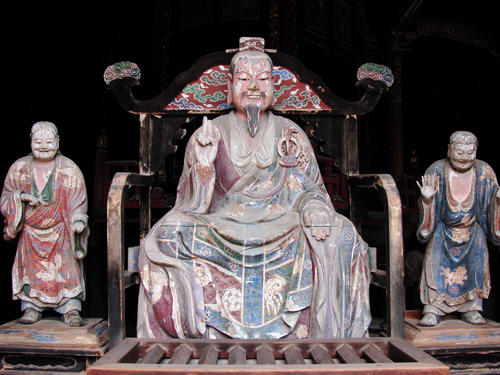 Once he was invited by Emperor Wu of Liang (who reigned from 502 to 549) to give a lecture on the Diamond Sutra. No sooner had he ascended to the platform than he rapped the table with his rod and descended. The poor emperor was simply lost in amazement. Yet Shan-hui asked, “Does Your Majesty understand?” “I don’t understand at all,” replied the emperor. “But the Ta-shih has already finished his sermon!” Shan-hui remarked. One day, wearing a Buddhist cassock, a Taoist cap, and Confucian shoes, Shan-hui came into the court. The emperor, amused by the motley attire, asked, “Are you a Buddhist monk?” Shan-hui pointed at his cap. “Are you then a Taoist priest?” Shan-hui pointed to his shoes. “So, you are a man of the world?” Shan-hui pointed to his cassock. 會成三家作一家 I have harmonized three houses into one big family! If, as Suzuki so well says, Zen is the “synthesis of Taoism, Confucianism, and Buddhism applied to our daily life as we live it,” the tendency was already prefigured in Fu Ta-shih. 空手把鉏頭 Empty-handed, I hold a hoe. 步行騎水牛 Walking on foot, I ride a buffalo. 橋流水不流 The bridge flow, but not the water. 無形本寂寥 Without form, without sound, all alone by itself. 不逐四時凋 Yet it changes not in the course of the four seasons. Rider & Co., London, 1960, pp. 143-145.
pointed his finger at his monk's robe. The bridge (but) not the water flows. The ascetic pointed to a peak and urged him to stay on it to rneditate. hence his alias 'Shan Hui'. Indian Patriarch failed to liberate emperor Liang Wu Ti. 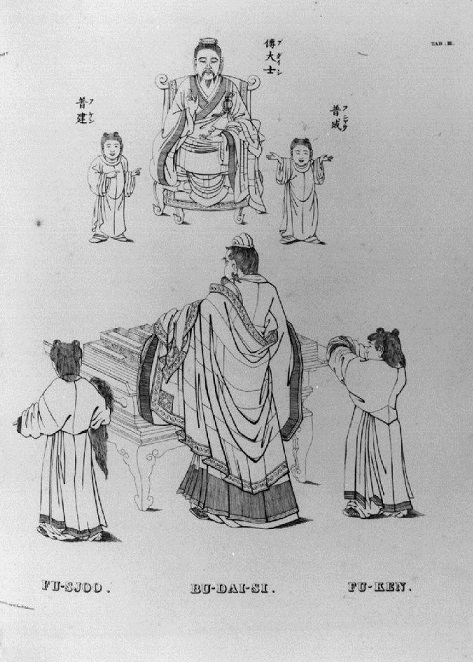 One day he presented himself at the palace to enlighten the emperor. and a layman no monk's robe. Each morning, (one) gets up again with him. (But) are like the body and its shadow. In the sound of (your own) voice, there is he. It has no form and is in essence still and void. (And) follows not the four changing seasons. for emotional things. Hence, the third gatha presented in the above text. human form which is endowed with two hands, to hold the hoe. him, which directs his two feet to walk. body at birth and leaves it at death. whereas the water, or the self-nature, is immutable and never changes. Einstein's Theory of Relativity which has no place in the Mind Dharma. An empty hand, grasping a hoe. On foot riding a water buffalo. The bridge is flowing, the water is not. Relying upon the ovum, consciousness arises, birth arises from love and desire. In a time now past he grew up, today he returns as a child. The stars follow the cycle of human life, red lips open for milk. Because we are deluded to our true Dharma nature, we still suffer in the cycle of birth and death. Look into the mirror and see how your face has changed, how climbing the stairs can take your strength. You let out a sigh: now you are old, going forward to bow, still your body is lacking. Your body is like a tree grown near a precipice; your mind is like a sea turtle longing for the ocean. Still indulging in your outflows, yet unwilling to study the unconditioned Dharma. Suddenly you contract a fatal illness, and because of this, become bedridden. Wife and children are silent and sad, friends dislike being near you. You suffer—pains in thousands of veins, groaning so that the entire neighborhood hears. Not knowing the dangers that lurk ahead, you still indulge in desire and anger. Consciousness bids farewell to life, a wandering spirit enters the gates of death. Countless numbers have departed—I have not seen a single person return. The favored horse waits with a shrill neigh in vain, the flowers in the courtyard will no longer be picked. 1: Literally “the four mountains,” a reference to the four masses of suffering mentioned in the poem: birth, old age, sickness, and death. Men are not to renounce the world to seek benefit. As this human body is difficult to obtain, you should feel shame for your faults. Diligently cultivate the Triple Gem,6 and go to the temple. Strive to do what is good. When the end comes, where will you go? Think of the bitterness of hell. Will, at a time not long from now, return to the land. It is most important not to eat the flesh of sentient beings. Then it is family from a past life. There is nothing more important than the truth. When his life comes to an end it will not be fortunate. The people who eat meat are truly evil spirits. In a future life you will be killed. Heaven and hell clearly exist. Or you shall spend five hundred lifetimes without hands or feet. Admonish one another to practice with urgency. Father, mother, wife, and child, crying in vain. 3: The five impurities of time, views, afflictions, beings, and life, and the realms of hell, hungry ghosts, and animals. 4: Reference to a fabled cemetery in the southern foothills of Mount Tai, but also more generally used to refer to the land of the dead. 5: A Chinese system of time division which divides the day and night into six periods each. These periods encompass the entire day. 6: The Buddha, Dharma, and Sangha. 7: A Buddhist practitioner who has vowed to become a Buddha to liberate living beings. Bodhisattvas that have progressed far in their practice are said to be able to assume any form to teach others. 8: Another name for the Chinese underworld. the farmer crosses a bridge. It is the bridge which flows away behind him, not the water. Afoot, yet riding a water buffalo. It is the bridge that flows and the water that stands still. The bridge flows and the water does not. His hiking is as if his riding on the buffalo. The bridge is flowing, yet the water isn’t. A younger contemporary of Bodhidharma, the famous "Mahasattva" (great saint) Fu, is another figure of prominence in the traditions of early Zen Buddhism. Some of his sayings remained favorites of later Zen practitioners. One of those unusual people whom Zen tradition refers to as "responsive manifestations," who are not known to have received teaching from a human mentor but were enlightened through inspirations resulting from their practices, Mahasattva Fu was a philanthropist with a considerable following that included his wife and children as well as other relatives. Walking, riding a water buffalo. The bridge but not the river flows. The first two lines illustrate the familiar theme in developed Buddhism of being in the world without clinging to things of the world, employing ways and means without becoming possessively attached to them. The second two lines illustrate the contrast between objective and subjective reality: "thusness," naked reality without the screen of mental construction, is in flux (as a river) but does not really change, in that it is always "as is." The mental structures used in crossing over the world, on the other hand, that is, the viewpoints, conceptions, and interpretations are rooted in subjectivity and undergo fluctuation and change, even if they are fixed from their own point of view. The realistic approach according to this teaching, therefore, would be to recognize the functional value of structures as tools and vehicles, but to also recognize their temporary nature and refrain from attachment to them even while using them. This permits contact with wider reality and freedom to adapt to changing conditions without the impediment of clinging to the familiar or habitual for its own sake. Thus in one single verse Mahasattva Fu summed up a central issue of Buddhism. Mahasattva Fu is not associated with a particular lineage but is believed to have received the transmission from reality itself through the medium of certain experiences. Folyik a híd, a víz meg áll.